We look forward to welcoming you to the Sheraton Tampa East Hotel. Conveniently located off Interstates 4 and 75, the hotel is 10 minutes from downtown, and Tampa International Airport (TPA) is just 20 minutes away. When youre here, enjoy the convenience of free parking and a complimentary shuttle service that runs to destinations within a 5 mile radius, including Brandon Town Center, Live Nation Amphitheatre, Florida State Fairgrounds, and Seminole Hard Rock Casino.Choose from our 266 inviting guest rooms and suites, each of which has one king or two double Sheraton Signature Sleep Experience beds. For more space during your stay, opt for a Junior Suite. All traditional guest rooms feature an outdoor balcony to enjoy the Floridas warm weather on patio furniture.There are plenty of ways to stay busy or relax here. Get a workout on our tennis courts or in the state-of-the-art Sheraton Fitness. Enjoy a swim in our heated outdoor pool that features two 25-meter lap lanes. In our lobby, registered guests can surf the web on our five computer workstations or bring laptops for complimentary wireless High Speed Internet Access. And gather with friends, family, or colleagues for a refreshing drink in our lounge area and a satisfying meal in Panfilos Restaurant.The Sheraton Tampa East Hotel has 21 elegant meeting rooms totaling more than 30,000 square feet of flexible event space, including the 5,000-square-foot Grand Ballroom. An outdoor poolside pavilion is ideal as a pre-function area and for an evening cocktail reception. 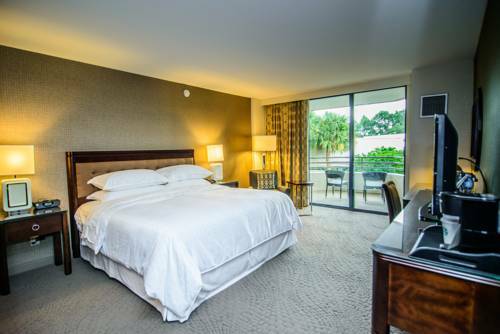 Tampa International Airport (TPA) is only 20 minutes away from the Sheraton Tampa East Hotel. In addition to complimentary parking, we offer complimentary shuttle service within a 5-mile radius, which includes such popular destinations as Brandon Town Center, Seminole Hard Rock Casino, and 1-800-ASK-GARY Amphitheatre. Also, Busch Gardens Tampa Bay is just minutes away. Keep the evening going with the savory flavors that come to life in our upscale restaurant. From mainstream to eclectic, we have tastes to suit any diner s palate. The evangelist's first ministry was on a Tampa street corner. Artists Todd Ramquist and Kiaralinda transformed their property using, among other things, an under-appreciated home decoration element: bowling balls. A small island built to attract visitors to a resort and restaurant features a fake lighthouse and a family of spider monkeys. Works for us.